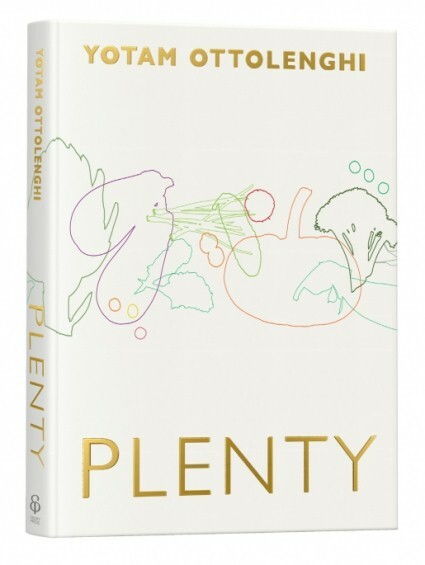 I must admit to approaching Yotam Ottolenhi’s Plenty with some trepidation. I am not a vegetarian. You may have noticed this. Vegetarian cooking just isn’t my strong point. I’m not militant about my meat-eating, though, and I’m not averse to vegetarian cuisine. I just don’t think about my cooking as either ‘carnivorous’ or vegetarian’. I just cook whatever I want, and sometimes that includes meat or fish and sometimes it doesn’t. This position is something that Ottolenghi breaks down and works with. He isn’t a vegetarian, either, and his slant on vegetarian cooking casts this division aside and concentrates on the food itself. A dish either has meat in it or it doesn’t. Plenty is just a collection of dishes that don’t. That’s all. I’ve seen and read Yotam Ottolenghi’s weekly column in The Guardian, and admired both his writing and the style of his food. Plenty is a collection of these recipes, along with many more besides. It’s a handsome, no, beautiful book, simply presented with heart-stoppingly good photography and clean and simple prose that connects directly with the essence of the food. Much of the food is drawn from the Mediterranean or Middle East, reflecting Ottolenghi’s own Israeli background, but more is inspired by North Africa and further afield. Whatever the original inspiration, Ottolenghi leaves his own innovative mark, lifting ordinary ingredients to a new level with radical twists and methods. Take the recipe for caramelised garlic tart, for example. Garlic cloves simmered gently and then coated in a dark caramel syrup, flavoured with the bitterness of rosemary and the sweet sharpness of balsamic vinegar, the cloves baked in a puff pastry shell with goat’s cheese, cream and eggs. Basic ingredients, magically worked into something new and exciting. There’s wit here, too, none more apparent than in a tart completely filled with potatoes, accented with oven dried tomatoes, a grand and unusual dish conjured from that most mundane of ingredients, a potato. Plenty is organised by ingredient. There are sections for roots, brassicas, mushrooms, pulses, pasta and so on. Ottolenghi acknowledges that these divisions are unsystematic and haphazard, with recipes categorised against either their core ingredient or the one that inspired the dish in the strongest way. The result is a meandering and relaxed book, with recipes and dishes sparking off one another and contrasting against each other. Plenty is an exciting read, especially for the non-vegetarian. As a cookbook, it’s both inspirational and comforting, filled with sparkling writing and irresistible photography. It’s a book that truly opens up the possibilities of cooking without meat and demonstrates just how good vegetarian cooking can – and should – be. I'm not a vegetarian either – but i do go meatless 3-4 times a week so the book interests me.Always looking to put a new spin on vegetables! Thanks for the review – I'm trying too to cut way down on my meat consumption so this could be a good read! I'm not a vegetarian, but have been trying to cut back on meat and make more healthful meal alternatives. I promised no more cookbooks this year, but you've piqued my interest on this one. (The garlic tart sounds delicious!). I'm going to have to take a look at this one! Thx for sharing. It's a wonderful book – I am, like a lunatic, cooking my way through it … the green pancakes actually made a friend of mine nearly cry last night (it may have been the wine, mind you). Lovely blog by the way – am so glad I found you. Thanks very much. You're right, it is a wonderful book, really quite beautiful, but accessible too. Trisha, I'm sure it'll make it over the pond fairly soon. It's simply too good a book not to. I've been singing it's praises to anybody who'll listen for ages now.